How to Grow Scallions | Grow This! Scallions are immature onions, pulled early in order to enjoy the entire stalk and bulb with a mild, less pungent flavor than mature onions. Scallions are often called green onions. They are just two different names for the exact same thing. Here’s how to grow scallions. Almost any onion harvested before the bulb has fully developed is considered a scallion or green onion. The species known as allium fistulosum is believed to produce the most superior scallion flavor and is known to be highly resistant to diseases and pests. Early spring is the best time to start growing scallions. For outdoor growth, seeds should be sown about 3 to 4 weeks before the last frost of the winter. If you’re sowing seeds indoors, start them 5 to 7 weeks before the last frost. If you live in a grow zone of 7 or higher, you can plant scallions in the early fall for an early winter harvest as well. Scallions can be grown just about anywhere. They take up very little space and make great container plants. Be sure to choose a location that gets full sun exposure, though they will tolerate some shade. Scallions can also be grown indoors if you have a sunny enough window or grow lights to be sure they get at least 6 hours of direct light per day. 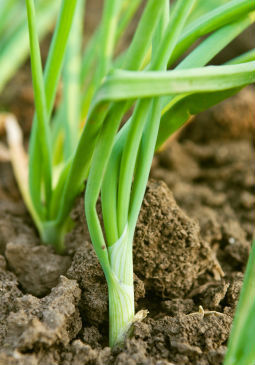 Scallions have a shallow root system so they don’t need a lot of soil to thrive, but they do need soil that drains well. Enrich your soil with compost before planting for better results. Keep the pH of the soil in the neutral range of 6.0 to 6.8. Sow onion seeds about ½ inch deep and ½ inch apart. If starting your scallions inside, seedlings can be transplanted outside about 2 weeks prior to the last frost of the winter. Space them 1 to 3 inches apart. You can use onions sets to grow scallions. Plant sets by pressing them into the soil about 2 inches apart and water thoroughly. Thin all seedlings to 1 inch apart. Carefully weed by hand to prevent root competition. Water your scallions regularly. Some varieties take a month to germinate but need consistent moisture the whole time. They’ll need about an inch of water per week. Keep the soil moist but never soggy. Container plants will need more frequent watering than those grown in garden beds. If you use nutrient rich soil, your scallions may not need much feeding during the growing season. If you choose to fertilize, use a well-balanced organic fertilizer or compost tea every few weeks until harvest. Scallions can be harvested once they reach 6-8 inches tall. Their flavor will become stronger the longer they mature, but are best young and tender. Both the green stems and the white bulbs are edible. Most green onions are ready to harvest after about 70 days. Do you have tips on how to grow scallions? Let us know in the comments section below.